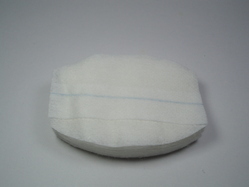 We are leading manufacturer and exporter of Sterile Eye Pads. 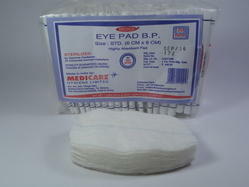 We have picked up years of experience and inside and out information in assembling and supplying Sterile Eye Pad B.P. We make every one of these cushions utilizing quality material as a part of hygienic environment conditions. Before conveyance, every one of the cushions experience clinical tests to guarantee no sullying. Being a customer oriented organization, we are engaged in manufacturing, supplying and exporting Aseptic Eye Pad. Offered eye pads are used for protecting eyes from dust, air & light after operation, injury or any disease. Manufactured in tandem with international standards, these eye pads are rigorously tested by our experts on different parameters to ensure their flawlessness, before the final dispatch. Standard size, Pack of 20 pads. We are leading manufacturer and exporter of Eye Dressing Pad BP Sterile. We have picked up years of experience and inside and out information in assembling and supplying Sterile Eye Pad B.P. We make every one of these cushions utilizing quality material as a part of hygienic environment conditions. Before conveyance, every one of the cushions experience clinical tests to guarantee no sullying. Port of Dispatch: Mundra Port , Gujarat State , India.